ICHHTO has introduced Tabriz in northwest Iran and Yazd in central Iran as creative cities to the Organization of Islamic Cooperation. Iran’s Cultural Heritage, Handicrafts and Tourism Organization (ICHHTO) has introduced Tabriz in northwest Iran and Yazd in central Iran as iranian creative cities to the Organization of Islamic Cooperation (OIC), said a senior official of ICHHTO. Mohammad Reza Pouyandeh added that UNESCO’s Cultural Department has implemented a project named “Creative Cities”. “OIC has also defined a similar project and asked member-states to introduce two creative cities for 2016 and 2017,” he said. Pouyandeh noted that all information regarding these cities are prepared and will be sent to the OIC Secretariat. “Recently, in a global conference held in Malaysia, good ideas titled Think City were raised. Currently, it is being implemented in some cities of Malaysia,” he said. The official also said the plan to designate creative cities could also be implemented at the national level. “We have planned a similar project inside Iran to select certain cities to create competition and use the potentials of their municipalities. This is a plan implemented by ICHHTO annually to introduce the iranian creative cities ,” he said. Tabriz is the fifth most populous city in Iran after Tehran, Mashhad, Isfahan and Karaj, one of the historical capitals of Iran and the present capital of East Azarbaijan province. Tabriz is the fifth most populous city in Iran after Tehran, Mashhad, Isfahan and Karaj, one of the historical capitals of Iran and the present capital of East Azarbaijan province.The city boasts many historical monuments, but repeated devastating earthquakes and several invasions caused substantial damage, Wikipedia reported. Many monuments in the city date back to the Ilkhanid, Safavid and Qajar periods, including the large Tabriz Bazaar Complex which was registered as a World Heritage Site in 2010. The oldest signs of the city’s ancient civilization are an excavation site and museum in the city center with a history dating back to 2,500 years. The early history of Tabriz is not well documented. Some archeologists believe Garden of Eden was located in Tabriz. A recent excavation at the site of the Iron Age Museum, in the northern section of Blue Mosque, uncovered a graveyard of 1st millennium BCE. The city was destroyed several times either by natural disasters or by invading armies. The oldest elements of present-day Tabriz are claimed to be built at either in the Sassanid era in the 3rd or 4th century CE, or later in the 7th century. The historical bazaar of Tabriz is one of the oldest marketplaces of Middle East and an Iranian architectural masterpiece. Tabriz Bazaar’s foundation is dated 2nd millennium BC. It is about three square kilometers in area and the largest roofed brick complex in the world. The main structure of the bazaar consists of two main roofed north-south lanes and several west-east lanes. The bazaar complex consists of a series of interconnected brick structures, buildings and enclosed spaces for different functions. Souvenirs of Tabriz include carpet tableaux, metalwork, dried fruits and nuts, as well as chocolates. 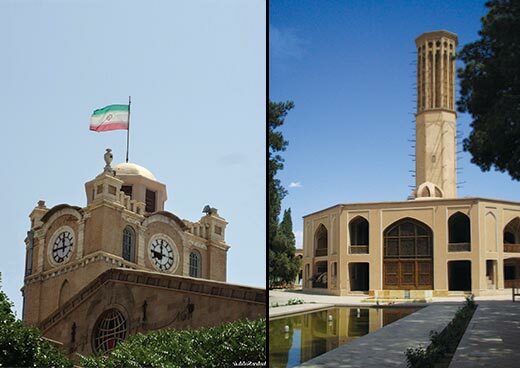 Yazd is the capital of Yazd province and a center of Zoroastrian culture. The city is located 270 km southeast of Isfahan. Because of generations of adaptations to its desert surroundings, Yazd is an architecturally unique city. It is also known for the high quality of its handicrafts, especially silk weaving, and its confectionary. The city has a history of over 3,000 years and dates back to the time of Medean Empire when it was known as Ysatis or Isatis. The city’s name is linked to Yazdegerd I, a Sassanid ruler. The city was definitely a Zoroastrian center during the Sassanid rule. Under the Safavid rule (16th century), some people migrated from Yazd and settled in an area along the Iran-Afghanistan border. The settlement named Yazdi was located in what is now Farah city in the province of the same name in Afghanistan. Even today, people from the area speak with an accent very similar to that of the people of Yazd. People of Yazd are well known for their peaceful, hardworking and systematic nature. One of the notable things about Yazd is its very family-centric culture. baqlava, qottab and loz-e badam, appeal to domestic and foreign tourists.